Looks Good from the Back: Adrien: Stay Puffed. Coats were never my thing until I met Nina. 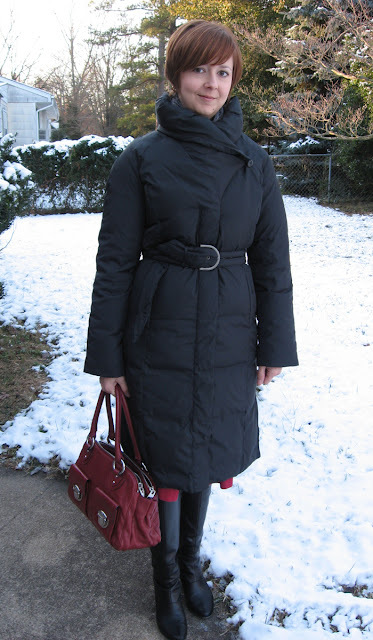 I was happy having one or two basic coats that I'd wear until they became unspeakable and fell apart. Then I became friends with Nina who has some of the most amazing coats I've ever seen, and my eyes were opened because a good coat can make you look sharp and pulled-together like nothing else. Seriously! Now I am the owner of many coats, though I didn't have a super warm coat to wear for my trip to Chicago last winter. So, Nina was nice enough to lend me one of her collection, a Cole Haan down-filled number with a belt and fold-over collar. The coat was amazingly warm and also easy to stuff into the overhead bin on the airplane. It was also surprisingly attractive for a big puffy coat. (It's hard to be glamorous when you're wrapped in a sleeping bag with sleeves.) I was sad to give it back! That's why when Nina offered to sell it to me dirt cheap back in August I jumped at the chance. I secretly hoped that by purchasing it, I'd ensure that it wouldn't snow at all this year. I love the different options for how to wear the collar. My friend used to have a coat like this that she let me borrow, but it was dangerous. Every time I leaned my head ever so slightly to the side it was like I was resting on a pillow, and I would drift off to sleep. Those were some of the best naps I ever took... I miss that coat. I wouldn't survive the winter without my puffy coat! This one is fabulous! 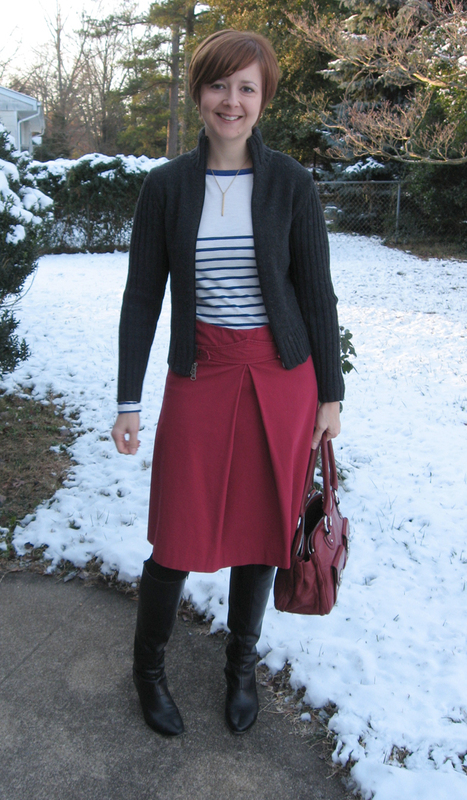 I enjoy your red skirt paired with stripes.